As we draw closer to our baby's birth, one project I've enjoyed, both this pregnancy and in my last, is creating a postpartum wellness kit for myself. So much of the pre-birth preparations are centered around the baby. 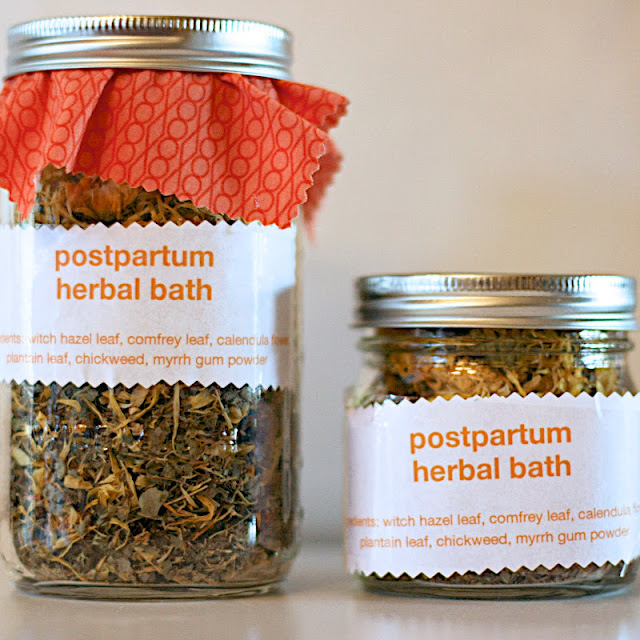 A postpartum wellness kit is a wonderful way to encourage a new mom to nurture herself, too. One of my favorite herbal allays to include in my kit is an herbal sitz bath. While the body is beautifully designed to heal itself after birth, herbs can gently assist in this work. The following recipe is adapted from my favorite book on postpartum wellness, Natural Healing After Birth by Aviva Romm. This recipe can be used for herbal baths, sitz baths and in the peri bottle. (It is absolutely for external use only.) I buy my herbs from Mountain Rose Herbs. Mountain Rose Herbs carries high quality herbs at great prices. I've been ordering from them for several years and have yet to be disappointed. Note: You definitely don't need to use every herb on this list. These are just ideas to give you options. The herbs in the top row are generally considered to be soothing and the herbs in the bottom row are healing and astringent. The herbs in the bottom row are commonly seen in most postpartum sitz bath formulas. You can choose as many (or few) as you'd like depending on what you have available to you. Fill your jar about 2/3 full with herbs from the healing list. Fill the remaining 1/3 with herbs from the soothing list, then give the jar a gentle shake to mix the herbs. Set the sea salt aside for later. For a Sitz Bath and Peri Bottle: Bring 2 quarts of water to a boil. Turn off heat. Add one large handful (about 1 oz) of herbs to the water. Steep, covered, for 30 minutes. Strain out the herbs using a fine mesh strainer so only the liquid remains. Set aside 1 quart to be used in the peri bottle and/or for compresses. Add the remaining 1 quart to a sitz bath tub (available at most pharmacies). Fill with warm water, adding 2 tablespoons of sea salt. For an Herbal Bath: Bring 4 quarts of water to a boil. Turn off heat. Add two large handfuls (about 2 oz) of herbs to the water. Steep, covered, for 30 minutes. Strain out the herbs using a fine mesh strainer so only the liquid remains. Add the liquid to the bathtub along with 1/2 cup of sea salt. Relax and enjoy! This is so cool! I'm done having babies biologically, but this is such a great idea for friends!!!! !